Like the Santa beach scene with wonderful embossing & layers. I grew up E coast of FL and now live in Central TX. Looks like there are 6 of us so far that have entered all the days. What a super layout and Santa is one cool dude. Thank you so much for taking time to post your very creative art with us this week at Word Art Wednesday, on our 192nd Challenge. Hi. hi... wonderful fun christmas card. So love this, a very different Christmas card, so perfect for those with warmer winters! 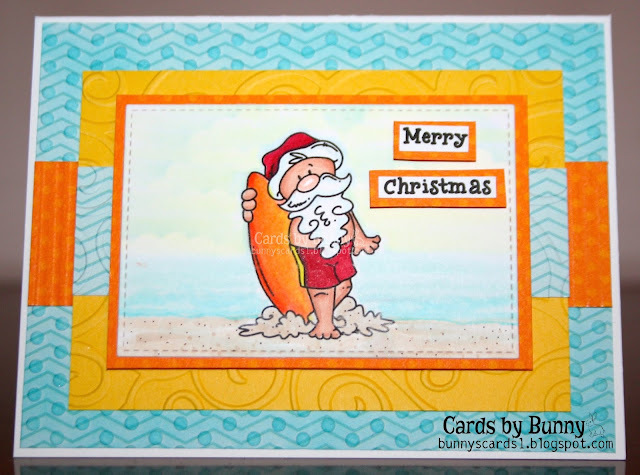 Gorgeous Christmas card, love the warm summer feeling it has, I can understand why Santa chooses your city, thank you for playing with us at Sweet Stampin', hope you can join our new challenge tomorrow. Happy Friday! Fab card, love the image - perfect for a Christmas in July card! Really cute card :-) Thank you for joining us in CCC.